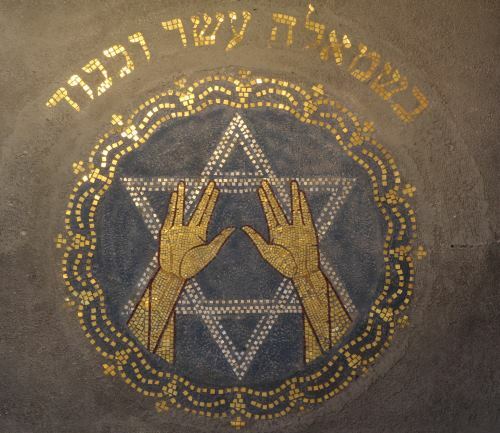 Is the Vulcan Salute a Jewish Symbol? I recently discovered that the famous Vulcan salute is actually a Jewish symbol. Is that true? If so, what does it mean? Yes, the Vulcan salute is an authentic imitation of the manner by which Cohanim spread their hands in most congregations when blessing the congregation to this day. Cohanim are those people that today comprise about four to five percent of the Jewish population,1 all of whom trace their paternal lineage back to Aaron, brother of Moses, who was also the first High Priest. The Cohanim performed the offerings in the Tabernacle and later in the Temple in Jerusalem. They are still afforded certain honors, and they still bless the congregation with exactly the same words with which Aaron blessed us over 3,300 years ago when we finally got the first Tabernacle up and standing. When the Cohanim bless the people, they stand at the front of the synagogue, face the congregation, cover their faces with their tallit (prayer shawl), and spread out their hands. They say the words of the blessing, one word at a time, following word by word the prompts of the cantor. In most congregations, they do this along with a melody, which differs according to the custom of the congregation. Do that correctly, and you have the original version of what became popularized three thousand years later as the Vulcan salute (just with both hands). …Rabbi Yosi said that when the Cohen raises his hands to bless the congregation, the people must not look at him, since the Shechinah rests on his hands. How is the Divine Name alluded to in the ten fingers? Because our ten fingers correspond to the ten sefirot, which are the ten divine modalities by which G‑d is known in this world, corresponding to ten divine names. We learned that when the priest raises his hands in blessing, the people must be in awe and fear, and know that at that time a time of goodwill prevails throughout the worlds, the upper and lower beings are blessed and there is no judgment among them all. That is the time when the most ancient and concealed is revealed in the small faces, and peace prevails in all. Quite befitting, as the last words of the priestly blessing are “and give you peace.” May the most concealed become revealed, and peace prevail in all our world. See David B Goldstein, Jacob’s Legacy, Yale University Press, 2008, page 27. Song of Songs 2:9. Midrash Rabba ibid. See Tur, Orech Chaim, 128. Additionally, the Shibolai Haleket (siman 23) explains that the Cohanim spread out their fingers to show their fear of the divine presence. Talmud, Ketuvot 24b (see Rashi). Shulchan Aruch 128:1. Bayit Chadash on Tur, ibid (specifically with hands raised and fingers spread). Zohar Bamidbar 147a. For a more complete explanation, see this lesson on our site. Should I Publicize My Newly Kosher Kitchen? What Blessing do I Say on an Onion? Why is Jewish Law so Petty Minded? Jewish customs: Too many reasons, or none at all! Why Is the Priestly Blessing Only on Yom Tov? The blessing hands "Was also an ancient sign of the Old city of Jerusalem.."
Holland? 'Xcuse me, but Enschede is not in Holland, but in the Netherlands. It's in Holland in much the same way as Bremen and Hamburg are cities in Bavaria. As the author of the image, though, i'd like to thank you for using it. Exploting judaism Exploiting Judaism, is As exploiting an occult. (is the Vulcan salute a Jewish symbol)(?) Our Judaism is being exploited by these controversies, I believe is ruining our spirituality of (one) (G-d) + our L-rd. Is this Bout Vulcan salute? 'Bout Torah? or is, This Cabala spirituality? !